Is it really here!? The 12th day of Dolce 12 days of Christmas? 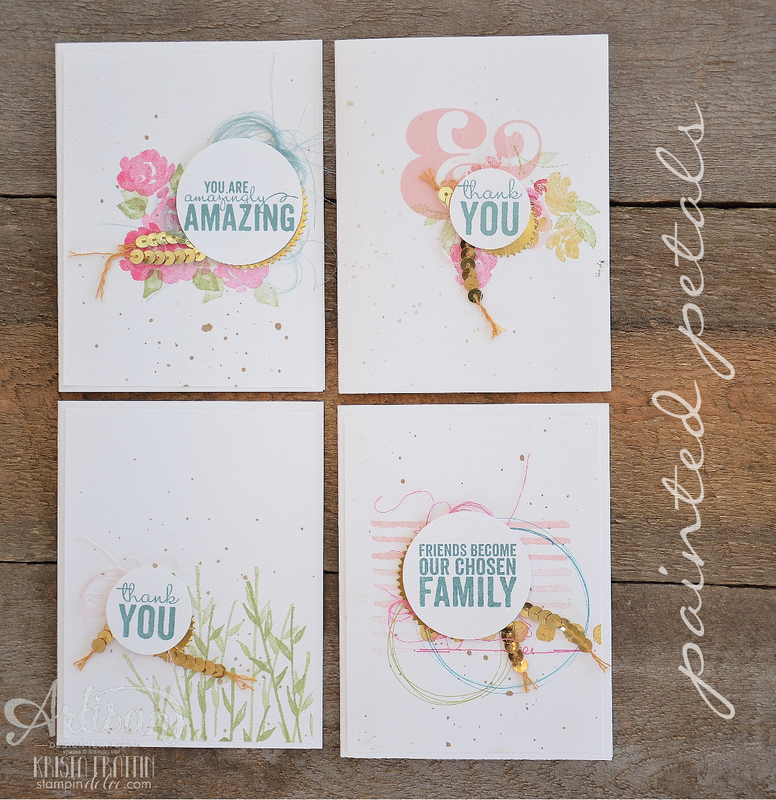 I have had so much fun creating and sharing with you this month! Christmas is still officially 5 days away and I am feeling wonderful about the season! Christmas has changed a lot for me over the years. Pre-children Christmas was a month long celebration filled with crafting, baking, decorating, visiting and a million other things. I have learned as a Mom to downsize and prioritize. We are in a busy stage of life with three young children. I am learning to not sweat the small stuff and to put first things first and do the things that matter most. I haven't baked in a few years now. I don't purchase as many gifts for as many people. I tend to purchase a dish or meal rather than make it. But that is all okay. I value time with my family and friends. I would rather take a family night to decorate a gingerbread house and watch a Christmas movie together. Or have a dinner with old friends. Or snuggle up and read a Holiday book to the kids. I guess it has helped remind me the reason for the season, and for me that is my children. I do miss baking and spending time personally handwriting Christmas cards by the Christmas tree. I miss spending hours decorating the house and doing festive crafts. I don't miss the hours in the mall agonizing over perfect gifts. I don't miss the pressure and the stress. The things I do miss will come back ... in time. As our children grow life will change and I will have more time. But for now it is about every little magical moment with them. On this simplicity theme I thought I would share one of my favorite Christmas gift giving ideas. It will save you that agonizing mall visit! Gift Box of CardsI created this custom box to hold my Christmas cards. The box bottom is created with a sheet of Kraft Card stock (11.75x 10.25"). Score in from each of the four sides at 1.5" and 3". Cut in from the edge of the card stock to the second score line at the top and bottom of the sheet. Fold the ends in and adhesive with Sticky strip or fast fuse. The top was created the same way but with a Window sheet (12 x 10.5"). Bag of CardsSlip your cards and envelopes in to a Cello Bag. Add a dash of ribbon and a tag! Keep in mind that they could really be any kind of cards that you may have! Birthday, Anniversary, Thank-you ... anything! For a professional look I took each card and put it inside a medium clear envelope. Included in that clear envelope was also a paper envelope. This made them look as if they came from a boutique! 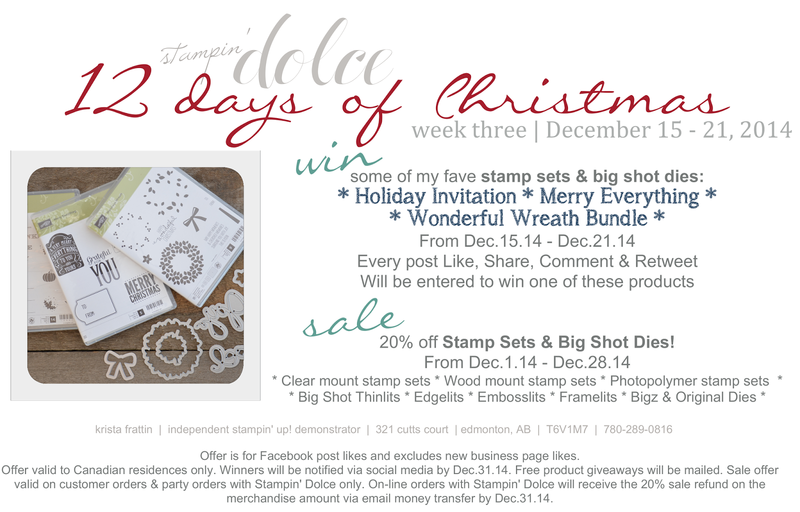 I hope that you have enjoyed following along with my Dolce 12 days of Christmas! This weekend is the last chance to enter to win my free giveaways. The sale on my Favorite things will end December 28, 2014. To enter to win the stamp sets listed above comment below (or on social media) and tell me ~ What is your favorite Holiday Tradition? Wishing you and yours a very Merry Christmas and a Happy New Year! Thank-you from the bottom of my heart for reading! Have a creative day! Can you believe your eyes? 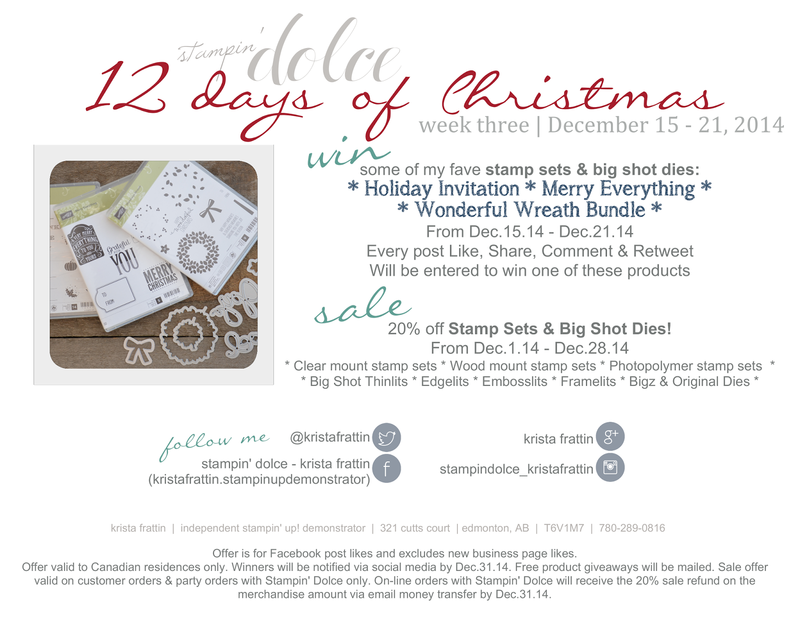 I am giving away the Wonderful Wreath Bundle this week! I use that glorious little Joy & Noel on everything! Stamp Sets have to top the list of my favorite things. Sounds simple and predictable but it is true! 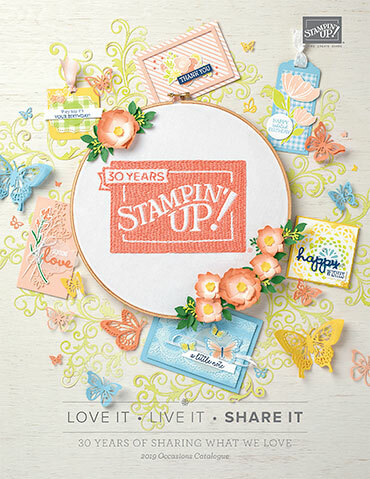 A stamp set can make my heart go pitter patter (and lots of them do! you should see my collection!). 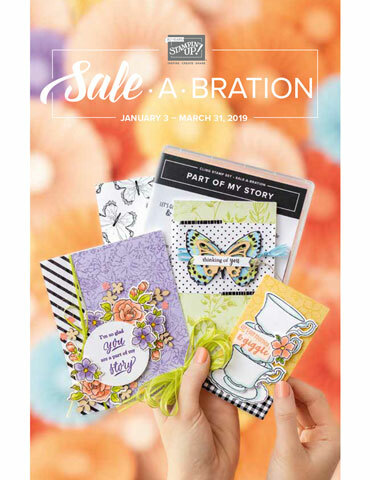 They are the prefect starting point for your project or the perfect embellishment to complete something. They are the best bang for your buck because they can be used again and again in many different ways. When a stamp set has a coordinating Big Shot die or punch my heart does not only pitter patter but it swoons! I know I am not alone! Today I have two quick Christmas gift tags that I recently did at the school with children in grade 1 and 3. To give this tag some life and dimension I stamped and cut two wreath layers. 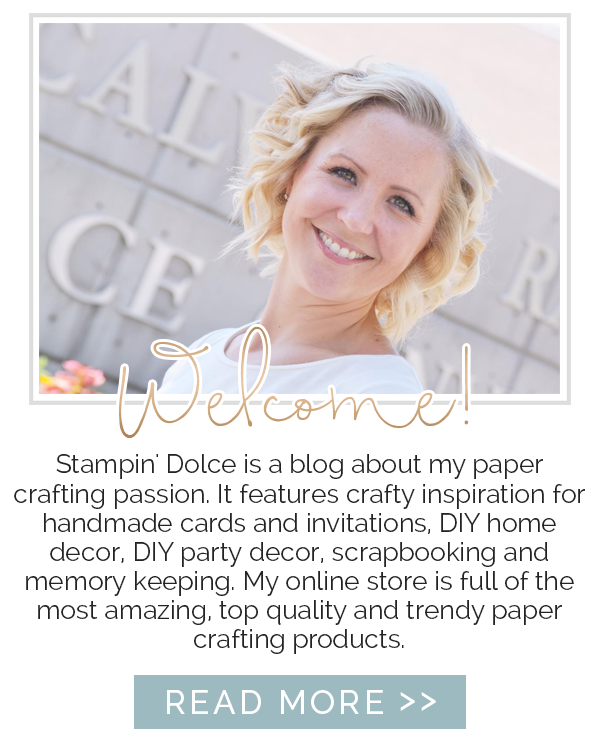 I sandwiched them together with Stampin' Dimensionals. The berries were stamped in Cherry Cobbler and then I added some Cherry Cobbler Dazzling Details over for a little sparkle. Remember to follow along all week for new project ideas and to comment to win my favorite stamp sets and that Wonderful Wreath Bundle! 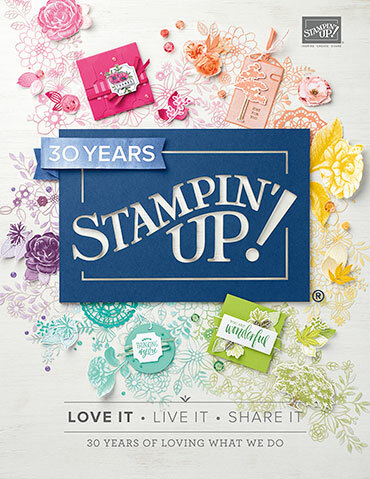 To enter to win today comment below and tell me .... what is your favorite Holiday Stamp Set? ?